Each summer, North Arkansas Electric Cooperative sends four high school juniors to the nation’s capital on the Electric Cooperative Youth Tour. The all-expense-paid trip includes tours of major sites in and around Washington, D.C., including the U.S. Capitol; the museums of the Smithsonian Institution; the Newseum; and the Jefferson, Lincoln, Martin Luther King Jr., Vietnam, Korean and World War II memorials. 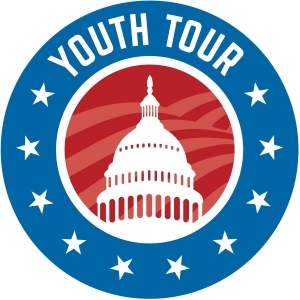 The 2019 Youth Tour will be June 14-20. The Youth Tour is sponsored by the Electric Cooperatives of Arkansas and includes teenagers from each co-op in the state. The group travels to Washington and returns to Little Rock by air. Once in Washington, the students join approximately 1,700 others from across the country. They learn about our government and electric cooperatives while improving their leadership skills. Applicants must be high school juniors, and their parents or guardians must be NAEC members. Winners are selected based on information provided in the applications and interviews. Applications for the 2019 Youth Tour were due March 14, 2019. Please contact Tori Moss at 870-895-6210 or tmoss@naeci.com with any questions. Trouble viewing application? Download Adobe Acrobat Reader.